Memorial weekend is almost upon us with to many is the unofficial official start to summer! Which means cookouts, camping, trips to the cabin, playing on the lake, campfires, and s’mores! Don’t worry I have the recipes that many have asking for since I posted a “failed” attempt at them last week. I spent a whole day this week but finally nailed the S’mores Pop Tarts! Tested and approved, even if they don’t look like I envisioned in my head, recipe coming Monday! 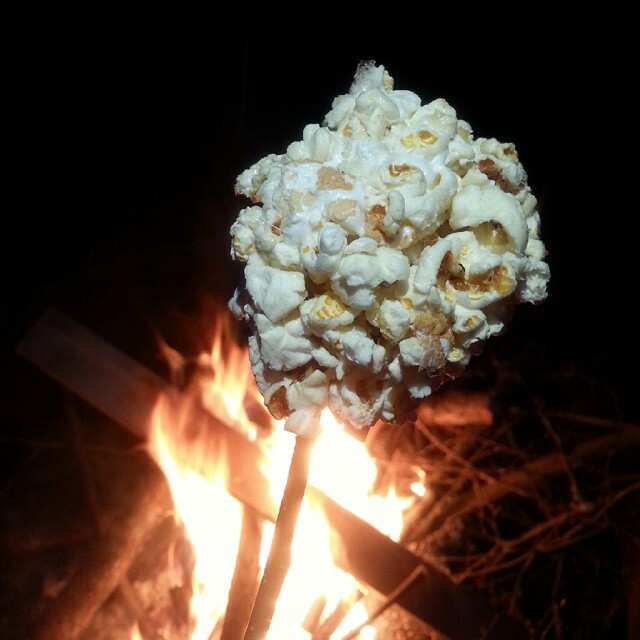 Don’t worry I have a fun one to tide you over until then, Roasted Marshmallow Popcorn on a Stick! They say everything tastes better on a stick but usually I don’t wait for them to cool and just eat it without the stick one big blob. Not as pretty but honestly not sure there was any way to make this Roasted Marshmallow Popcorn on a Stick look pretty. Not everything has to be pretty to be good. Somethings in life aren’t pretty but life can still be pretty darn good! Throwing it back to a recipe first made over 5 years ago, but made many times since. I even won a contest Angie’s BoomchickaPop (was just Angie’s back then, 5 years ago) with this creation when I threw together sitting by the campfire rolling my roasted marshmallow kettle corn! It was so good, basically a yummier version of a popcorn ball. A combination of my families love for roasted marshmallows and popcorn (which is enjoyed almost daily in our house). A photo, I think it might actually be the one I entered the contest with, from 2015 popped up in Facebook this week. Playing with flavors it can be made with a simple sea salt popcorn for a sweet and salty combo or Vermont Maple Popcorn for a sweeter version. If at home or at a place with electric I can simply pop a bag of Quinn Vermont Maple. 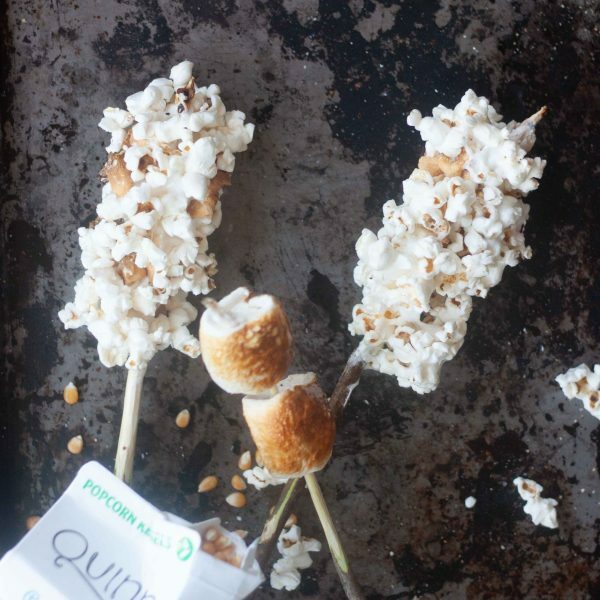 If camping out in the woods I pop Quinn Organic Popping Kernels with coconut oil (using a little more than normal) and sprinkle with a little maple sugar! Oh and if you really want the chocolate too roll it in some chocolate chips, the options are endless and some pretty awesome creations come when you are relaxed and just let your creativity flow sitting around a campfire, like my Grilled Peanut Butter Jam Nana Sandwich! Not to mention endless s’mores combinations because my family loves those! Hope you have an amazing weekend and enjoy your unofficial, official, start to summer! 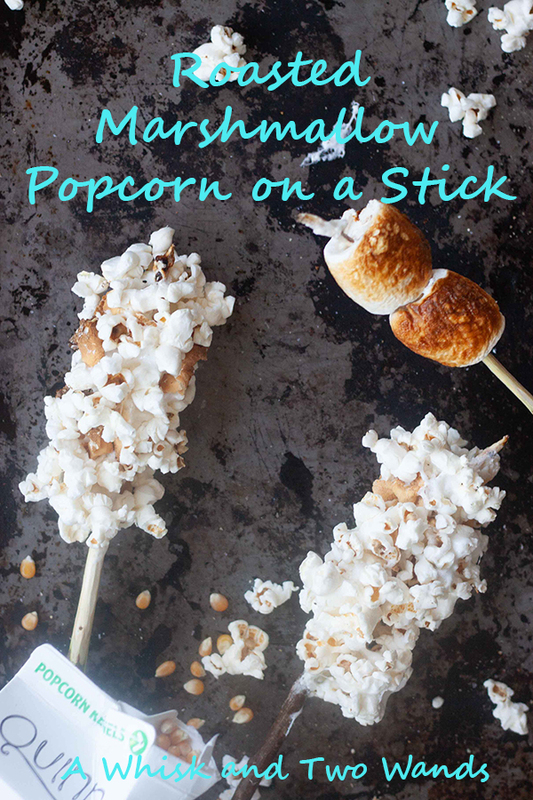 Fun and tastier version of a popcorn ball made with roasted marshmallows on a stick! 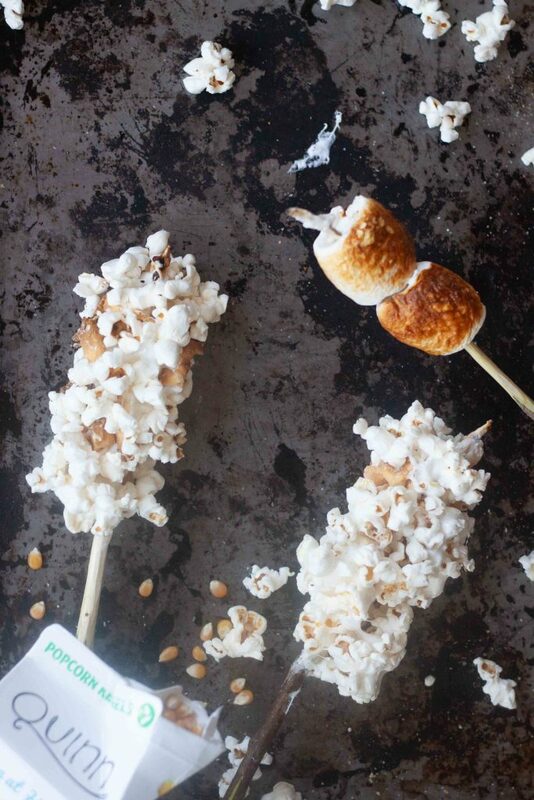 Fun Roasted Marshmallow Popcorn on a Stick is a gluten free and vegan friendly treat to make and enjoy around the campfire this summer! Pop or make popcorn. If making popcorn over the fire make sure you have heat but not to hot or too close to the embers or it will burn. Melt coconut oil in a cast iron pan with a lid before adding popcorn. Carefully remove from heat when there are 5-10 seconds between pops and set aside. For microwave popcorn pop per package instructions. 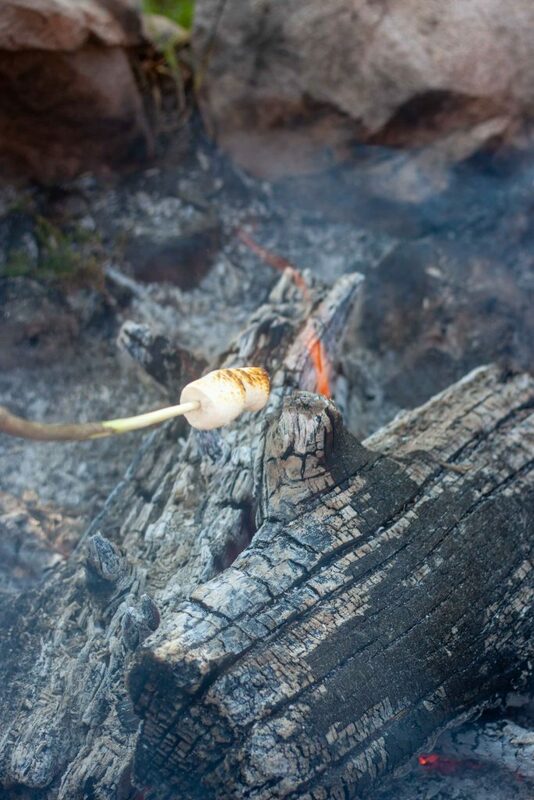 Place 2 marshmallows on a stick and roast over fire as desired, golden or burnt the choice is yours. 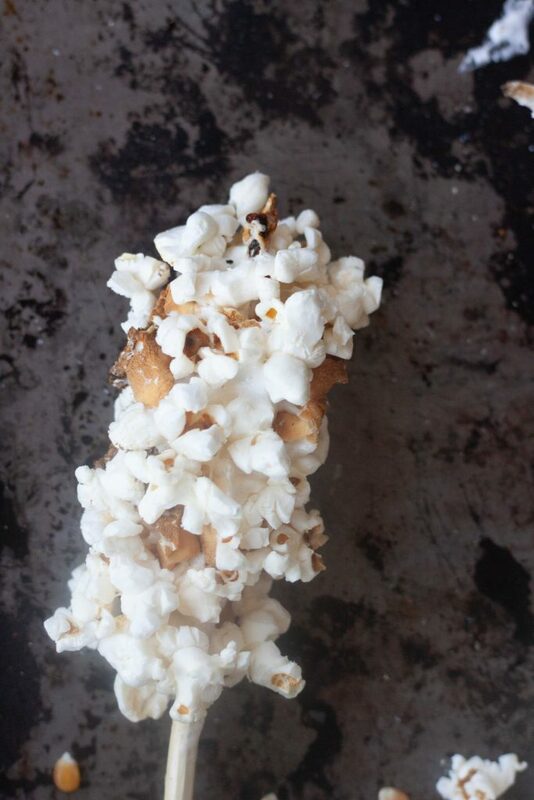 Carefully roll in popcorn, and other toppings as desired, if needed spread popcorn on a plate to make it easier. Or if wanting to make a single marshmallow fill a cup with popcorn, dip the roasted marshmallow in and roll it around. Let cool to harden if you want to enjoy it off the stick (I would not recommend eating off a metal roasting stick as you may burn yourself). Or just remove from the stick and enjoy! *If using Dandies Vegan Marshmallows you will need to press the popcorn on as the outsides are not sticky. Still delicious, trust me, but might not look as pretty. Easy, delicious, and fun! Hope you enjoy them this summer! Jules Shepard recently posted…Mother’s Day Gluten Free Recipe Roundup!